A new initiative in Scotland is encouraging young farmers to get into the pig industry, including livestock farmers looking to diversify. Andy McGowan, chief executive of Scottish Pig Producers, outlined the available opportunities for sheep and beef farmers to enter the industry at a conference in Perth, highlighting a need to keep fresh blood coming in. He detailed how potential new entrants are partnered with a processor requiring space. 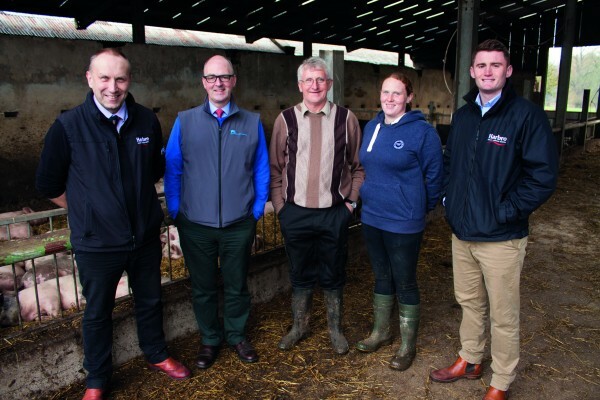 Iain Lyle, technical support manager for pigs at Harbro, visits them to calculate the level of investment required, estimated to be typically between £5,000 and £10,000, the throughput of the business and potential return on investment. He then suggests one of a number of options, such as a custom-built system or a review of existing buildings that might just need the introduction of feeders and drinkers, or additional gates and pens. Harbro also advises on feed and dietary options. “The starting point is to look at what you’ve got and to see how pigs can fit in. Jennifer Hall from Upper Carbarns Farm works with her dad, Wilbert, who owns the business. They have around 250 Limousin cattle, including 60 breeding cows, and run 80 sheep as a sideline; they also grow wheat. Structural changes on the farm were minimal – the support from Harbro and SPP has enabled the unit to add some new dividing gates to keep the pigs in smaller batches, although there are now plans to build a new shed which will be better suited to pigs, especially for splitting and weighing.